Debate at a legislative town hall meeting heated up over personal property taxes and health insurance exchanges on Saturday as local lawmakers traveled the district to hear from their constituents. 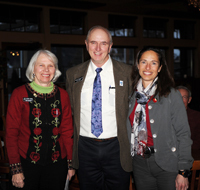 Sen. Michelle Stennett, D-Ketchum, and Reps. Steve Miller, R-Fairfield, and Donna Pence, D-Gooding, held a Bellevue town hall meeting early Saturday morning before continuing to Shoshone, Gooding, Wendell and other parts of legislative District 26. The get-together began with a discussion of the Idaho Health Insurance Exchange Act, a bill that was heard Tuesday in the state Senate Commerce and Human Resources Committee that would set up a state-based health insurance exchange. The purpose of the exchange is to create more competition among health-insurance providers, as well as to ensure that the state is in compliance with the federal Patient Protection and Affordable Care Act of 2010. Stennett said the state-based exchange gives Idaho more control over governance of the exchange than if it had chosen to participate in a federal health insurance exchange. Miller said he agreed the debate would be long, but said it might not be particularly useful. “The problem is that a lot of that [debate] is emotional discussion, not factual debate,” he said. The bill includes oversight of the exchange by a 14-member committee that includes representatives from insurance companies and state businesses, as well as two citizen members and the director of health and welfare, who would only vote if there were a tie in the committee. Tom Hanson, a member of the Region V Mental Health Board overseen by the Idaho Department of Health and Welfare, said he hopes the health insurance exchange will help protect coverage for the mentally ill and would not result in further cuts to the Department of Health and Welfare. He argued that the mentally ill are as much in need of preventative services as those who are physically ill, and that the mentally ill wind up in the court system if their conditions are not properly treated. Stennett said she agreed, and that expansion of Medicaid under the Affordable Care Act might help people in need of mental health services—especially veterans—access the resources they need. “We have to stop looking at the corrections end of it,” she said, adding that the recent gun violence debate might serve as a starting point for mental health discussions. According to the Idaho Department of Health and Welfare, 92 percent of gun deaths across the state in 2010 were suicides. Pence said she was concerned about the current debate over education appropriations. When the Luna laws were defeated, she said, money that was appropriated for certain programs was suddenly left unallocated. “It left a big chunk of money in no man’s land,” she said, adding that the Senate and House education committees are working on bills to determine how the money will be allocated for fiscal 2014, when the stop-gap appropriations measures taken to get school districts through this fiscal year would expire. The lawmakers also discussed a potential personal property tax repeal, which would allow small businesses not to pay taxes on things such as display shelving, computer equipment and other items used during daily operations. Stennett said the tax is “onerous” because it takes a long time to assess all of the items included in the tax, but that something must take its place to allow cities, counties and taxing districts to function properly. “We have to allow them the autonomy to assess other revenue,” she said. Miller said he agreed that the personal property tax should go, but that he would prefer the state cut what he called “unfunded mandates,” or requirements that the state forces on cities and counties without providing funding for compliance. “Philosophically, that works for me,” he said.